In essence, autoimmunity is when the body attacks itself. The function of the immune system is to help protect you from disease. However, when the immune system doesn’t function properly it can mistakenly identify your own bodily tissue as an invader and therefore mount an attack – the immune response! The concept of health according to the ancient science of Ayurveda is explained in terms of healthy digestion [agni], balanced doshas [vata–pitta–kapha], preventing ama [toxins], and preserving ojas [vital essense of life]. When all these factors are balanced then it’s said that the person will be strong, healthy, and live a long and happy life. According to the teachings of Ayurveda, there are three doshas called vata, pitta, and kapha. We can think of these three doshas as the guiding principles that keep all our bodily functions balanced and healthy. “Health results from the natural, balanced state of the doshas. This principle of ‘like increases like’ clearly explains that if one of your doshas [vata, pitta, or kapha] becomes imbalanced then it’s likely that you will experience symptoms which directly reflect that particular quality which belongs to the imbalanced dosha. Likewise, when a certain quality [i.e. hot quality] of a dosha becomes imbalanced the best way to re-establish balance is simply to introduce the opposing quality. For example, cool & cold qualities help to balance the hot quality in order to regain a state of balance. As mentioned above, “ama” is the by-product of poor digestion and is thought to be toxic to the body. The by-product of poor digestion may accumulate in the colon and create a hostile environment within the G.I. tract; i.e. supporting unhealthy gut flora. Not only does this support an unhealthy gut flora but even worse, it supports the process of fermentation and putrefaction. “When food is digested improperly because agni [the digestive flame] is low the undigested food becomes vitiated [disturbed] and collects in the stomach. Having strong Ojas helps maintain optimum health and many diet and lifestyle factors can contribute to either depleting or nourishing ones Ojas. Ojas is defined as the pure essence of the bodily tissues and is considered the refined by-product of healthy digestion. In essence, ojas is referred to as the source of vitality, immunity and vigor in the body. According to Ayurveda, vata dosha and bone tissue [asthi dhatu] are intimately connected. Vata primarily governs the element of space and the porous nature of bone makes the skeletal system one of the primary sites of vata dosha. The colon is also the primary site of vata. Interestingly, the mucous lining of the colon membrane is responsible for the absorption of minerals which support bone tissue. This emphasis the connection that connective tissue disorders and skeletal conditions [i.e. rheumatoid arthritis] begin in the gut. As explained above, if the digestive fire [agni] is diminished then this impaired digestion will lead to the formation of toxic by-products of poor digestion called “ama”. Eventually, the toxic substances of ama begin to accumulate in the colon and begin to get absorbed into the general circulation. Due to the intimate relationship of the colon and bone tissue much of these toxic substances [ama] get carried by vata dosha to the skeletal and connective tissue [primary sites of vata dosha] – this illustrates the initial stages of rheumatoid arthritis. The residue of ama [toxins] that chronically resides on the cell membrane gives rise to an attack on various tissues such as connective tissue, bones, and joints which correlates well with our modern view of the rheumatoid factor. Healthy digestion and the prevention of ama are the first steps in preventing disease. The initial management of autoimmune conditions is to break the chain of toxemia. The first goal is to prevent the formation of by-products of poor digestion [i.e. ama]. Therefore, fasting or eating light and easily digestible food is the initial management. Likewise, to help improve the digestive flame [agni] and burn some of the toxins [ama] you may also want to consider spices such as cumin, mustard, and ginger powder. Longstanding autoimmune conditions like rheumatoid arthritis have residual toxins within the synovial membrane and joint space. Therefore, Ayurveda would recommend applying the principle of heat [i.e. hot sauna, steam bath or hot shower] to help loosen up the ‘stickiness’ of ama. By loosening up ama from certain tissues and/or joint space, one can then apply certain pastes externally on the joints. This will help to pull out toxic ama and help to reduce pain, swelling, and inflammation. Certain pastes which can be applied externally [onto the joints] are formed by certain powders such as bachan, dhattura, and vacha. All of these considerations should be considered under the guidance and supervision of a qualified Ayurvedic professional and after having discussed these options with your primary care physician. According to Ayurvedic principles, bitter herbs consist mostly of ether and air elements. These subtle elements of [ether + air] allow bitter herbs to spread into subtle channels of tissue [i.e. articular surface within the joint space]. Generally, bitter herbs are cooling. However, there are some bitter herbs such as rasna, guggulu and parijata which are heating and therefore are able to enter into subtle channels of tissue [i.e. articular surfaces] and help ‘burn toxins’ [ama] – ama being that which is stimulating the autoimmune response. Pungent herbs like trikatu help to improve the function of the digestive fire [agni] while helping to burn toxins [ama]. 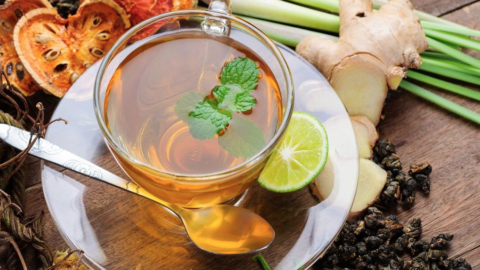 Trikatu is a combination of ginger, black pepper, and pippali which helps to clear toxins within both the digestive system and tissues of the body. Because trikatu and pungent herbs can enhance the function of the immune system, it should only be considered under the guidance of a qualified ayurvedic/herbal professional and after first discussing these options with your primary care physician. Panchakarma is an Ayurvedic purification system which helps to remove impurities and toxins from the physiological channels of the body. With proper purification of the body springs forth greater cellular intelligence allowing for optimal functioning of the body as a whole. Turmeric is widely utilized in Ayurvedic Medicine in treating allergies, immune conditions, liver diseases and neurological disorders. It is considered a holy, auspicious and natural healer. Blend all ingredients in a blender. Add more avocado if you desire a thicker consistency. This is strictly for educational purpose only and not medical advice. Always first consult your primary care physician before considering any new health regimen.